Another morning walk to Mendenhall Glacier. It is beautiful no matter what the weather. On this morning the fog was just clearing. I liked the warm reds on the peaks contrasted with the deep purple in the shadow from another mountain. And of course the little bits of left over fog are always interesting. 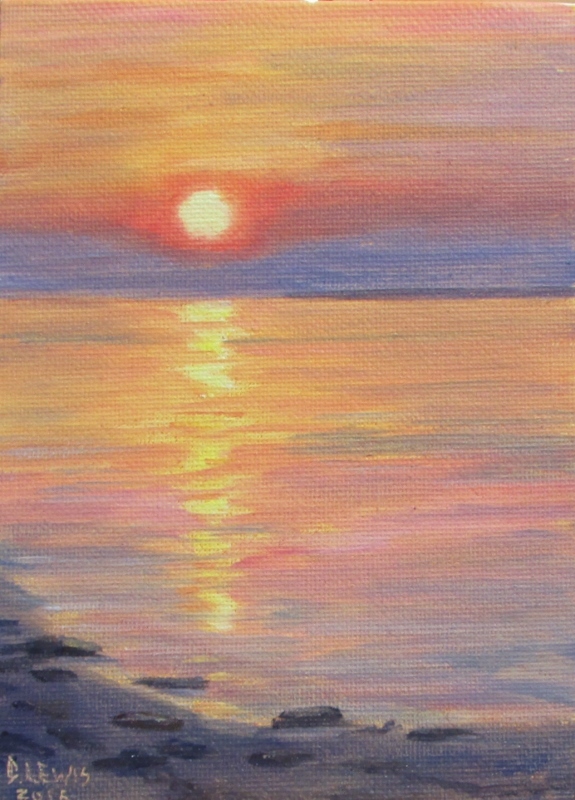 This is a 5×7 oil on canvas…mostly meant to be a study of the light effects. This was really enjoyable to do. I’ve done a few sunsets now and struggled with them more. This one came together a bit easier. It’s very simple but a sunset is always best, in my opinion, when kept on the simple side. I like how it reads a little differently depending on the light coming into the room. I have been wanting to do this for a while. 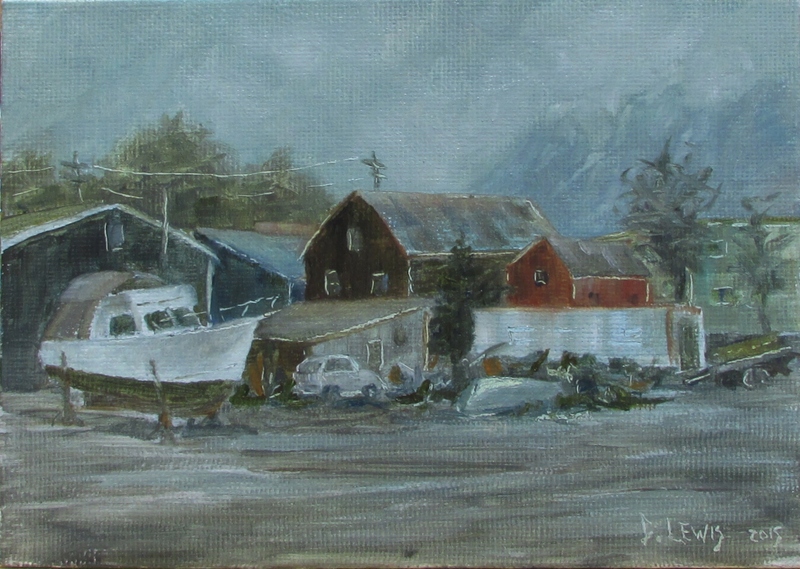 I liked it because I tried something new and used a gray-blue toned canvas, to help with the gray mood of this day. Juneau is very rainy, so this mood is very typical. Something about that, as well as the conglomeration of buildings and objects made me want to paint this scene. I am definitely drawn more to a strong, sunny scene, but I would like to be able to capture different types of weather and light conditions. This will be my final example for now of how useful a more detailed Underpainting can be. This is another wooded scene where my trees could easily have all gotten lost or run together as I went along. 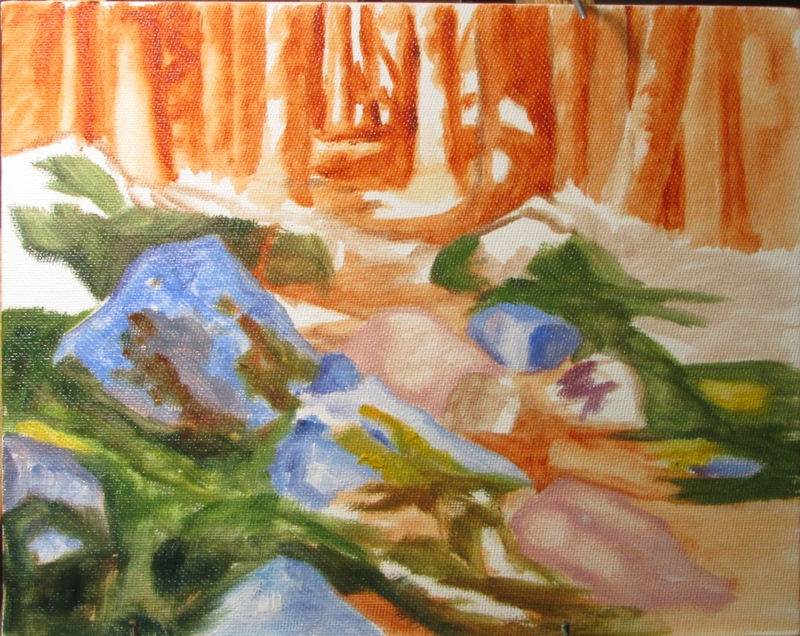 By having my Underpainting sort of map out my values, it was much easier to keep track of where my trees were separated. This also was helpful for me to see whrere it was important to perhaps place a darker tree next to a lighter one in order to distinguish it or make it more focal. It really is nice to be able to play around with your composition and value at this point before you have invested too much time. For me, it is invaluable when the painting has much detail. I thought I would show another example of an Underpainting, because when I first started painting I couldn’t get enough information about the different ways that people choose to paint. 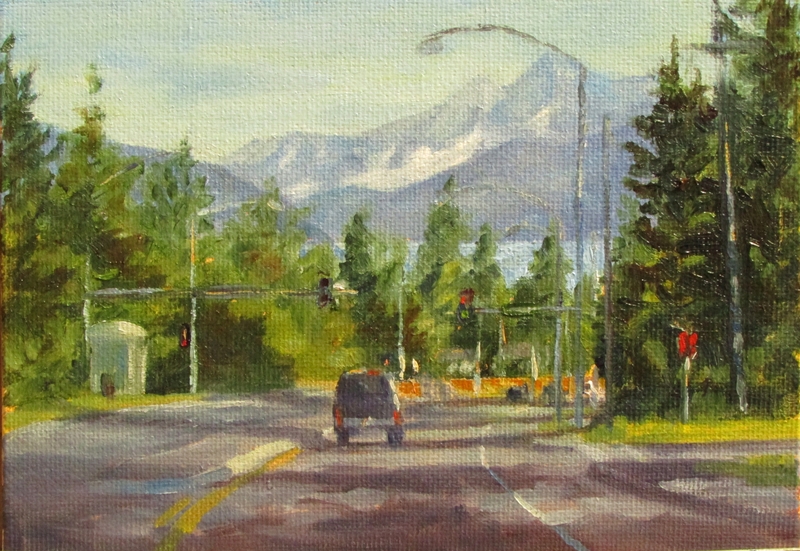 I enjoy seeing how other people paint…it gives me ideas and may lead to better things. It’s good for us to know that there is not just one way to do things. Rather there are a vast number of ways to do the same thing! I think this is very helpful to know. Actually, I think this little painting is the very first time that I tried doing an Underpainting. You can see just how much detail I included in the early stages. I’m sure this may be old news to many people, but I can remember how fascinated that I was with it early on. So I wanted to do a few posts to show any beginners how they might try it. I am actually quite taken with this little painting. There is something very pleasing about its simplicity. 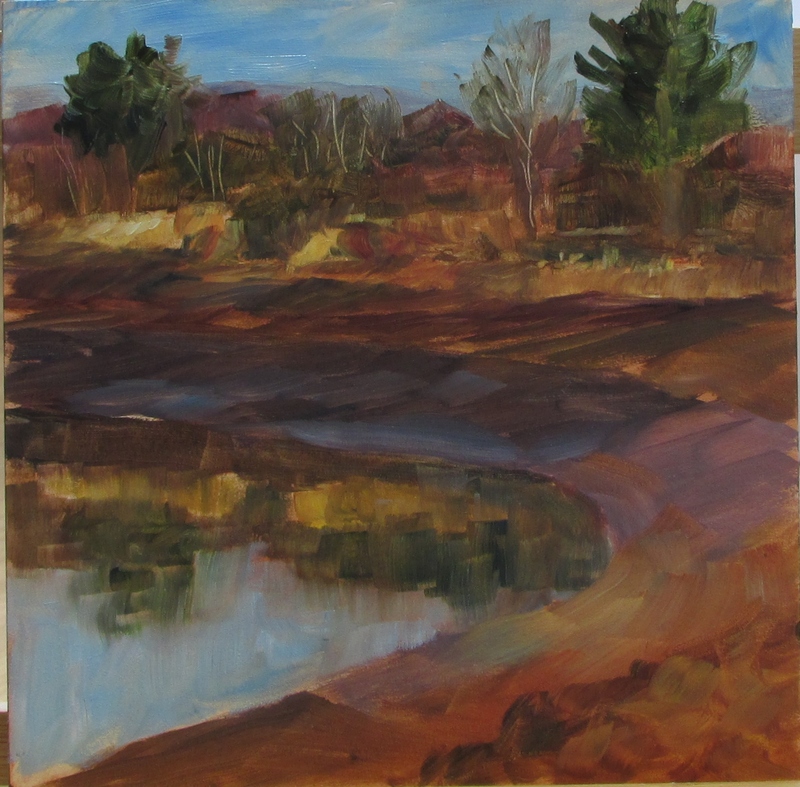 To try a painting using just one color is a great process for beginners. I even think that this practice is helpful for more advanced painters. 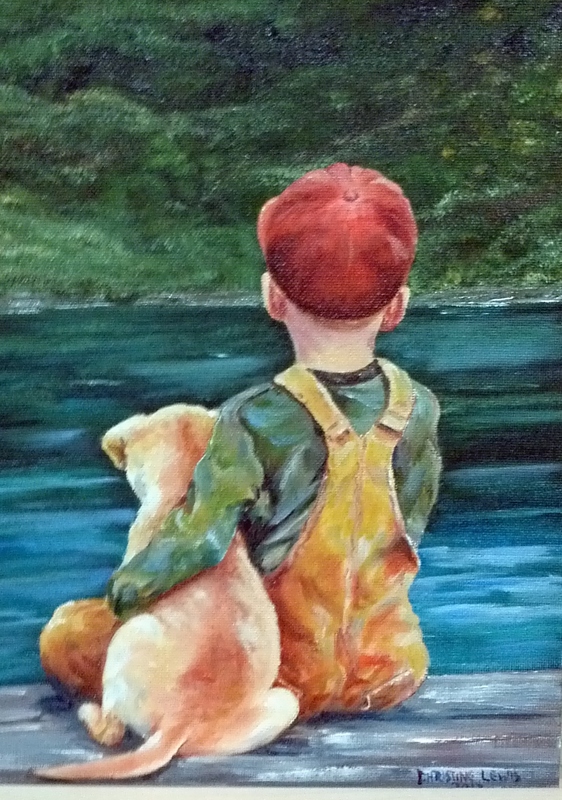 This is useful In many ways… like helping one to recognize the values in the painting. After doing this you could more easily adjust your values to emphasize different areas of interest or intensity. This can also help one to see the unnecessary details of their subject. This is also good practice for how one might do an underpainting of their subject. 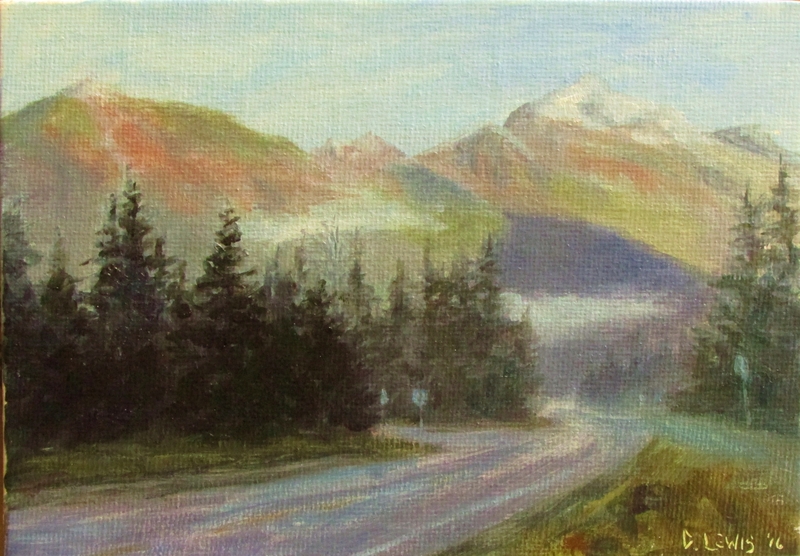 Many artists will do a complete, thinned down, two tone painting like this before they add their color. That way they can concentrate on adding color without thinking about the value as well. This is often helpful when the subject matter has a lot of detail. But this is not a necessity, just a matter of preference. I have done some of these underpaintings and found them very helpful. But there are many times that I just want to be more spontaneous. (as a side note, this post should have come before the last one) I would be interested to hear about anyone else’s experience with this process as well. 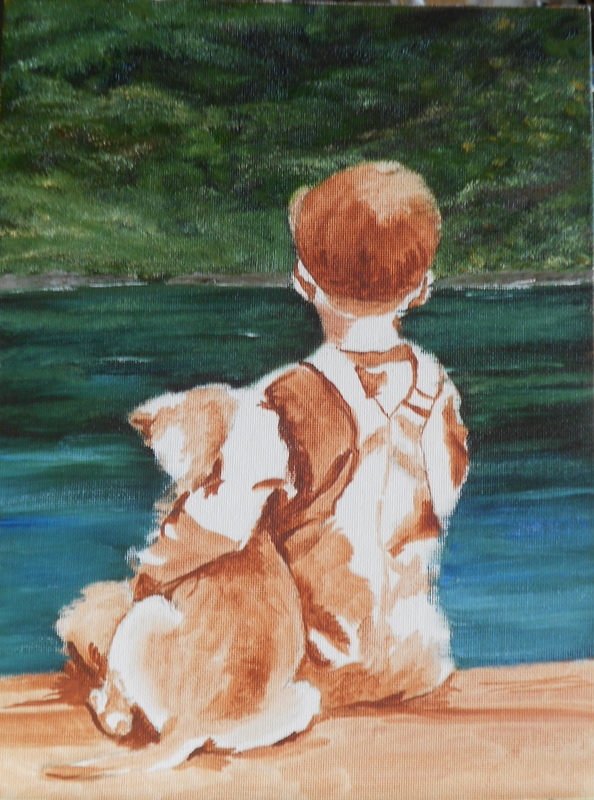 This is one example of how I used the underpainting process. The detail in this particular picture probably didn’t warrant the need but I was still experimenting with it at this point. But you can clearly see how helpful it is to see the value in a two toned painting. And I must say again, that at this stage, it is really easy to adjust something that may look a bit off. This layer of paint should be very loose and thinned down with turp or mineral spirits. 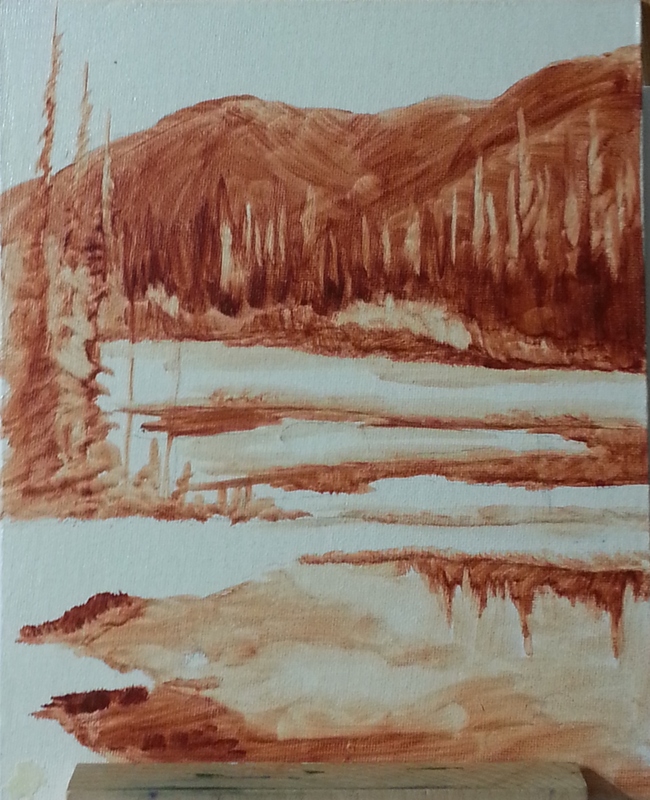 You don’t need to add white to your burnt sienna, you just thin it down a bit more. It is also very easy to wipe something off and redo it. If nothing else, I find this quite fun to play around with because you can move the paint so easily. This is my second painting on gesso board. I also used a pallet knife. I deliberately kept this loose. These low tide scenes where you can see beach forever always appeal to me. So I just thought I would do something a bit different. You can probably see that I don’t have one favorite subject yet. 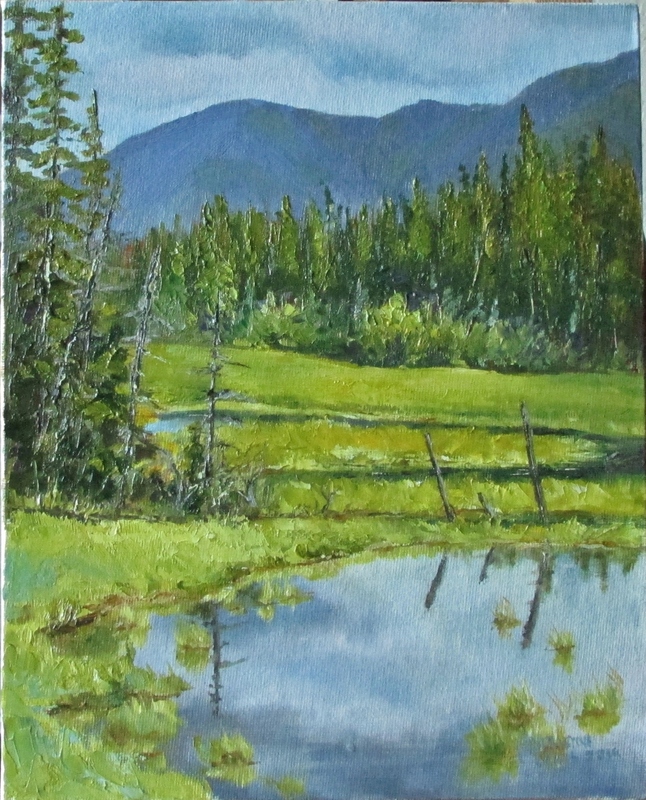 I am enjoying the learning process and trying all types of subjects as well as different light. 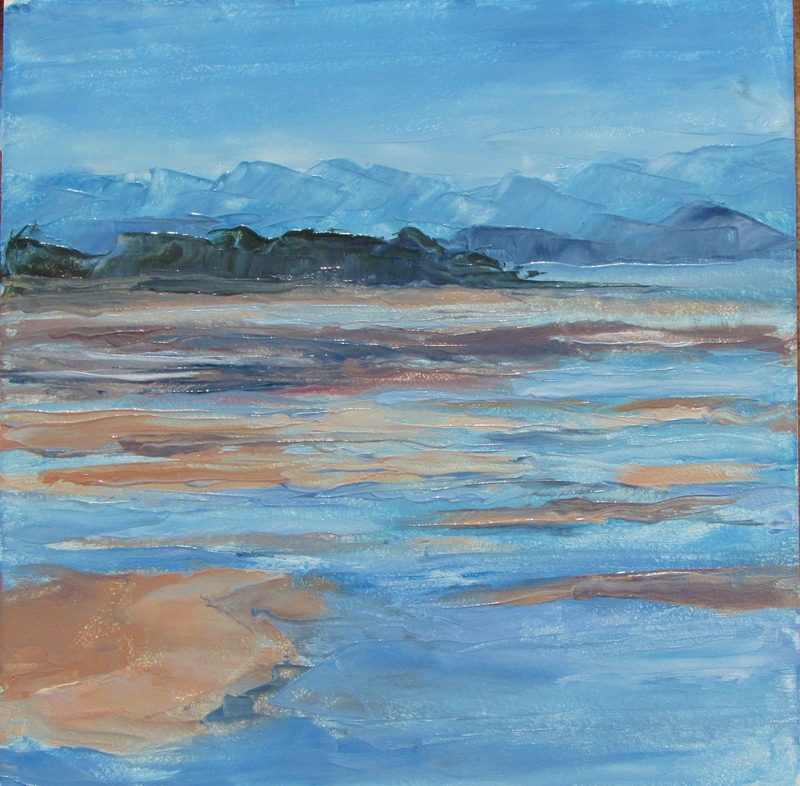 This is a 6×6 painting, and it is the first painting that I have done on Gesso board. I have been wanting to try this since my first post. I read in Carol Marine’s book that she uses it and likes it. There are several artists whose paintings have a smooth flowing brush stroke style and I have been unable to get that in my paintings. It seems like they must either use gesso board or a smoother canvas than I do. 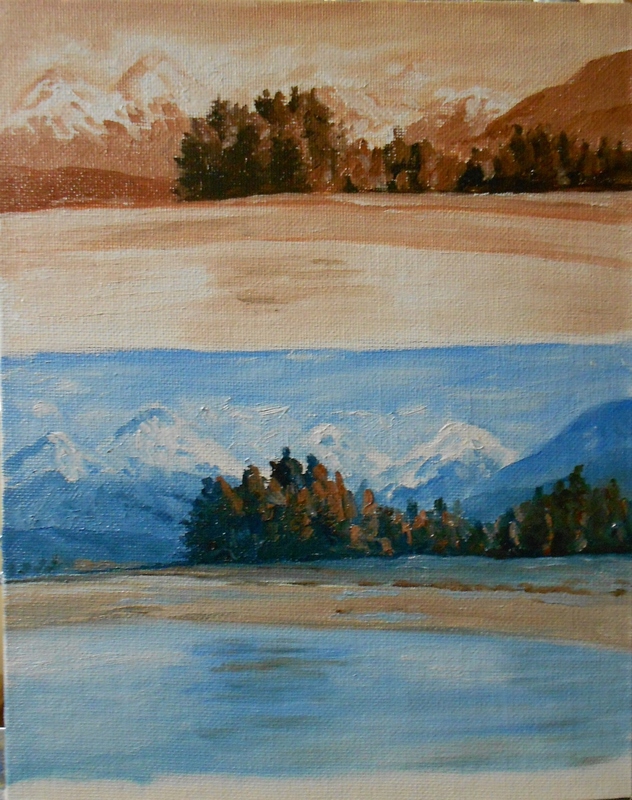 To save on cost, I have given into using an inexpensive canvas board most of the time for these small practice pieces. But it does not help to practice what doesn’t work for you. I need to begin either using Gesso board or prepping my canvas in a different way to create a smoother finish. I have recently found another brand of canvas board that is not too expensive and does have a wonderful smooth coating. (the brand is Art Advantage) I cannot get it here in Juneau, and shipping is always expensive to Alaska so I have not used it on a regular basis. But I am beginning to think I should. I will have to get a bunch when I travel back to Maine next month. Anyway, I did enjoy the Gesso board. It is a little tricky to learn a lighter touch with the brush so you don’t pull paint off with a second stroke, but I especially like that the brush strokes remain visible. This is merely a preference, and many people do not like this look. I do look forward to playing around with it more.